Chapter 13 will allow you to pay as little as 10% on debts owed for parking tickets to the City of Chicago. There is no limitation on when the ticket was issued. Thus, the debtor can repay a portion of the debt owed to the city for any outstanding parking tickets issued for any year whatsoever. This is a huge distinction. The city will allow you to pay back the actual cost of the ticket within the last three years. 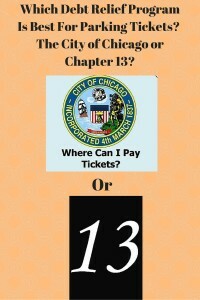 Chapter 13 will allow you to pay as little as 10% of the cost of any ticket issued at any time by the City of Chicago for parking violations. This major difference in the amount that can be repaid is what makes the City of Chicago’s debt relief program hardly enticing. Now it is true that not everybody wants to file a chapter 13 bankruptcy. It is also true that many people benefit by chapter 13 bankruptcy by being able to reorganize other debt in addition to parking violations in the same manner. Thus, if someone has credit card debt, medical bills, personal loans, utility bills that are past-due, prior auto repossessions and other debt, the debtor can put all of those creditors in a chapter 13 reorganization plan and pay back less than what is owed over a three to five-year period. The amount that the debtor pays back is based on the income, expenses, assets and liabilities of the person. In my experience over the last 24 years, most debtors pay back between 10% and 25% of their total outstanding debts. Thus, if you have parking tickets exclusively, you should still examine chapter 13 as it provides a greater form of relief than the City of Chicago’s debt relief program. If you have debt other than parking tickets, chapter 13 should be looked at to explore a repayment plan to get out of debt for less than what is owed over a three to five-year period. For more information on how you can be helped under chapter 13 and to learn your rights under the bankruptcy code, you can contact my office directly at 847-520-8100. We always have attorneys available to answer your questions and guide you through the process. We offer an initial consultation that is without charge. We want to make sure that our clients are aware of their rights and possibilities under the bankruptcy code before ever charging a fee. And most importantly, before engaging with the City of Chicago and their limited debt relief program, take a good, hard look at Chapter 13 to solve your financial issues.